The Wenger company was founded in Courtetelle, Switzerland by Paul Boechat in 1893. Boechat began making the Soldier’s Knife around 1901, and in 1905 began making a knife very like Karl Elsener’s Officer’s Knife. Managing Director Theodore Wenger moved the factory to Delemont and shut down the Courtetelle plant in 1900. In 1907, after working for Boechat's Coutellerie Suisse for ten years, Theo bought controlling interest of the firm and renamed it Wenger & Co. Wenger, like Victorinox, is one of the members of the Swiss Cutlers Union. Theodore Wenger’s wife, Lisa nee Ruutz, was well-known in Switzerland as a writer and illustrator of children’s books. Their oldest daughter Ruth would marry Hermann Hesse, author of Steppenwolf and Journey to the East. The weird, mystical trademark stamps of the Boechat years, the confusion of factory moves, a disastrous fire, the inter-office family feuds and take-overs, compared to the orderly father-to-son management of Victorinox: the histories of these two Swiss knife companies could not be more different. 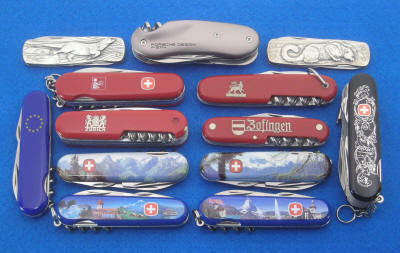 In 2005 Victorinox bought out Wenger, saving the smaller company from financial straights, and more importantly saving the integrity of the Swiss Army Knife brand from purchase by “outside interests”. They maintain separate marketing and product development, and will continue to offer competing brands, with the constant quality and innovation this intelligent arrangement ensures. Over the years (Victorinox just celebrated their 125th year) both companies have invented new tools to put on their knives and will continue to add new models to their extensive line-ups. The quality, ingenuity, and general usefulness of their products set a standard that the rest of the world can only hope to be inspired by.